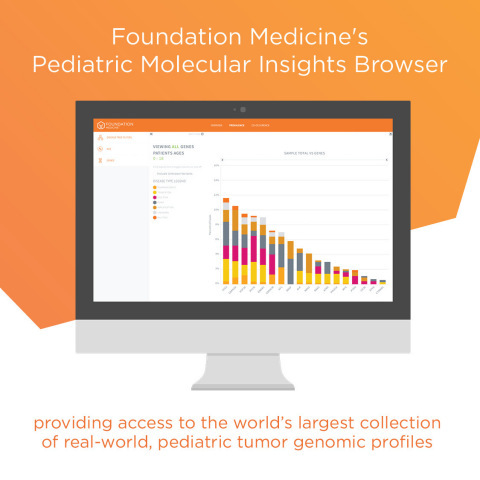 Foundation Medicine's Molecular Information Supports Discovery of Precision Therapeutics for Pediatric Cancers | Foundation Medicine, Inc.
CAMBRIDGE, Mass.--(BUSINESS WIRE)-- Foundation Medicine, Inc. (NASDAQ:FMI) today presented new data from more than 1,200 pediatric tumors across 51 cancer subtypes that were analyzed using the company's comprehensive genomic profiling assays, FoundationOne® and FoundationOne® Heme. The dataset reveals novel and potentially targetable genomic alterations identified during pediatric cancer clinical care that offer the possibility for new research towards novel therapeutics. In a separate but related announcement at the White House Precision Medicine Initiative Summit in February, Foundation Medicine made this data set publically available for research to motivate and accelerate development of new therapies to fight pediatric cancer. These findings were presented in a late-breaking poster titled "Genomic profiling of 1239 diverse pediatric cancers identifies novel discoveries across tumors" by Juliann Chmielecki, Ph.D., associate director, cancer genomics at Foundation Medicine, at the American Association for Cancer Research (AACR) Annual Meeting 2016 taking place April 16-20 in New Orleans. Genomic profiles from 51 disease subtypes representing sarcomas (26.6 percent), other blastomas (22.4 percent), brain tumors (20.4 percent), hematological malignancies (19.5 percent), carcinomas (9.8 percent) and gonadal tumors (1.4 percent). Alterations with proven clinical actionability in pediatric cancers (BRAF V600E and ALK, NTRK1 and ABL1 fusions) were found in 3.9 percent of samples across brain, sarcoma and hematologic cases. Three novel ALK fusions were identified in a neuroblastoma (BEND5-ALK), a soft tissue sarcoma (IGFBP5-ALK) and an astrocytoma (PPP1CB-ALK), respectively. Two novel BRAF fusions were also found in an astrocytoma (BCAS1-BRAF) and a ganglioglioma (TMEM106B-BRAF). This large data set also challenges the paradigm of "disease-specific" alterations as previously characterized fusions involving ALK, NTRK1 and PAX3 were observed in novel diseases from which they were originally reported. This press release contains "forward-looking statements" within the meaning of the Private Securities Litigation Reform Act of 1995, including, but not limited to, statements regarding the ability of data collected from comprehensive genomic profiling of pediatric cancers,to support the discovery of precision thereapeutics for pediatric cancers, All such forward-looking statements are based on management's current expectations of future events and are subject to a number of risks and uncertainties that could cause actual results to differ materially and adversely from those set forth in or implied by such forward-looking statements. These risks and uncertainties include the risk that the molecular information contained in the pediatric dataset is not suitable for research purposes, the pediatric dataset is not accessible,and the risks described under the caption "Risk Factors" in Foundation Medicine's Annual Report on Form 10-K for the year ended December 31, 2015, which is on file with the Securities and Exchange Commission, as well as other risks detailed in subsequent filings with the Securities and Exchange Commission. All information in this press release is as of the date of the release, and Foundation Medicine undertakes no duty to update this information unless required by law.